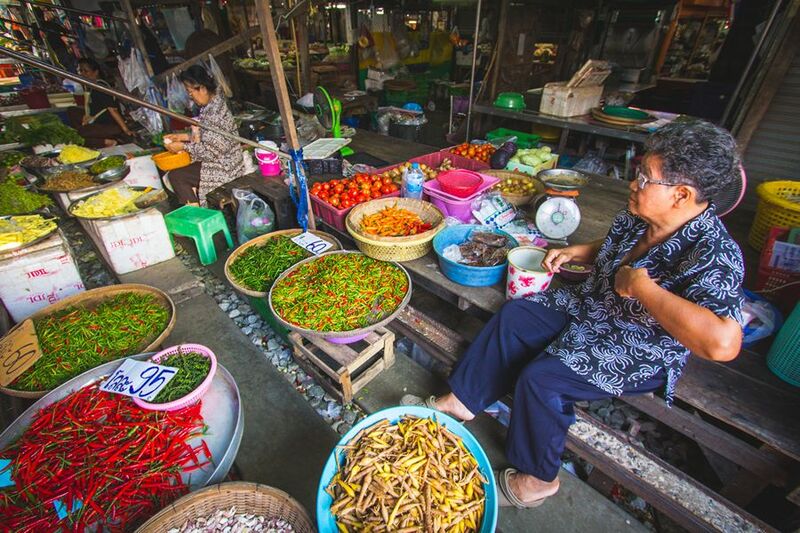 I love exploring the markets around Bangkok, there are so many to choose from. 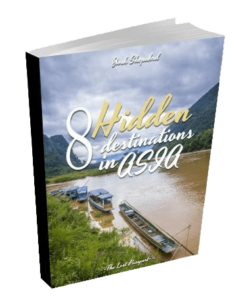 There are floating markets, street markets, night markets and, railway markets. The Maeklog Railway Market is perhaps one of the most unique attractions in Thailand and is a must-do if you are visiting Bangkok. The crazy thing about the Maeklong Railway Market is that one minute there are umbrellas and stalls scattered everywhere. Hundreds of people go about their shopping as per usual until a train turns up. The market quickly packs away right before the train goes right through the middle. Then, in a matter of seconds, it unfolds back into a busy market. Now that’s something to write home about. Here’s a photo of me sitting under those umbrellas in the market. A couple of minutes later there was a train here. The Maeklong Railway Market is a small market on the railway tracks next to Maeklong Railway Station. When there are no trains around, you can easily forget this is actually an operating railway line. When the train sounds its horn, it turns straight back into a railway line. The market is cramped under the fold out umbrellas. It is quite hot, and there is a lot of activity going on. The locals walk around slowly, and all over the place. Be patient as you walk through the market, otherwise, you will just get frustrated by the foot traffic. It is interesting to see how half of the store owners are asleep on the ground behind their shop. I guess there is no better way to escape the midday heat than to sleep through it. Even better, no one will push cheap souvenirs in your face. This is definitely an authentic little local market still. What Can I Buy at the Bangkok Train Market? 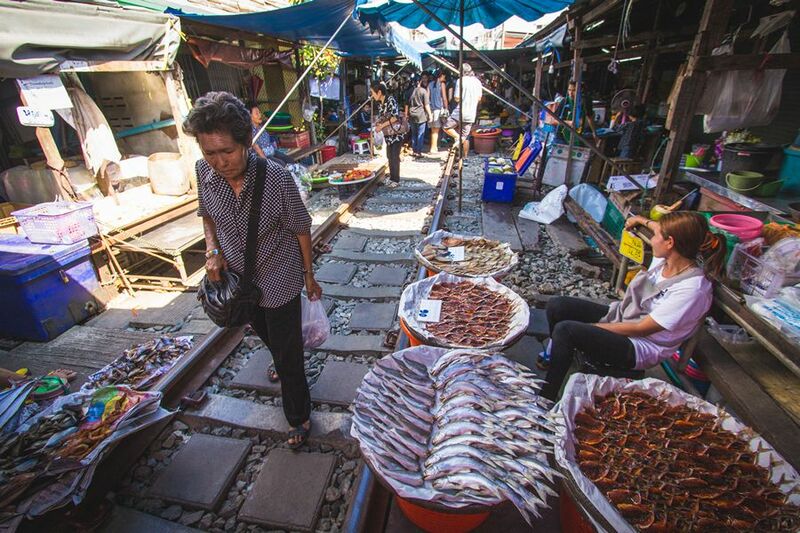 The Maeklong Railway market has lots of fresh seafood. For most foreign travelers with nowhere to cook, this probably isn’t of much interest. However I suggest you try some of the dried fish or dried squid, it’s a local favorite, and ready to eat on the go. There are also loads of fresh fruits available which have been grown in the neighboring province of Ratchaburi. Be sure to try the crunchy pink Rose-apples and the huge juicy Pomelos. If you’re brave enough you can even try some fresh Durian! These three are some of the most popular fruits in Thailand, and there’s no place to get them fresher than at the markets. There’s also a wide selection of Thai desserts available at the Maeklong Railway Market. I’m not familiar with the names of all of these, but they’re definitely worth trying. Some desserts are good, and some are interesting. It’s a lucky dip, so just take your chances. Around the market, you will also find some small restaurants and cafes. A meal is about 100 THB which is a fairly standard price. Look out for the guy on the corner who sells homemade ice cream, it’s definitely worth a taste too! You will not find tacky souvenirs or electronics at the Maeklong Railway Market. For these, your best bet is MBK in Bangkok. 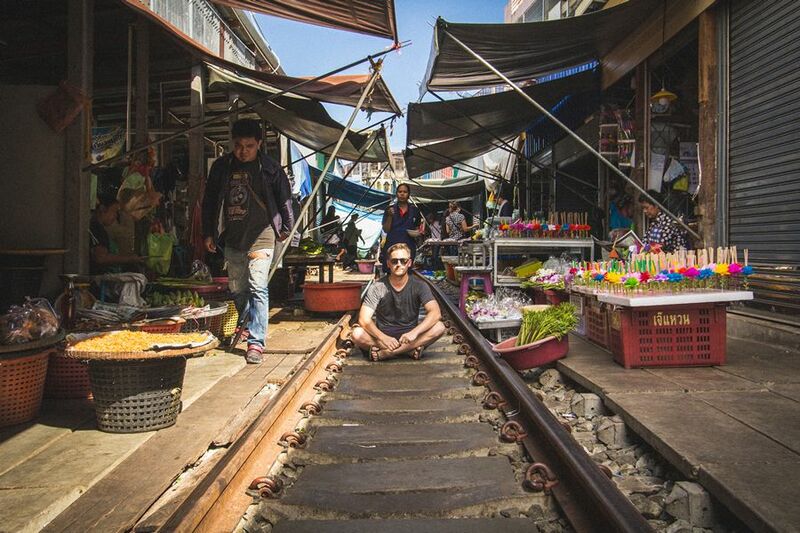 Where is the Maeklong Railway Market? The Maeklong Railway Market is located in Samut Songkhram Province. This is about 1 hour south-west of Bangkok, just beyond Samut Sakhon. The area is surrounded by small canals and the Mae Klong River which flows out to the ocean in the Gulf of Thailand. The market is only a short distance from the Damnoen Saduak Floating Market, and the busier but more authentic Amphawa Floating Market. They’re both worth checking out if you are visiting the area. There are a few different ways to get to the train market from Bangkok. The option you take depends on time, budget, and your adventurous spirit. I personally go by minivan, as it is the quickest and cheapest. Minivan: departs Bangkok Southern Bus Terminal (Sai Tai Mai) and the Northern Bus Terminal (near to Mo Chit BTS) for 70thb per person. Minivans depart from the Southern Bus Terminal every 40 minutes or so. The trip takes 90 minutes and drops you off right by the market. Do not go to the Victory Monument bus terminal, services ended in 2016. Taxi: a driver for the whole day costs about 2,000thb which is economical with a group of 4. The driver can also take you to the Damnoen Saduak or Amphawa Floating Markets for the same fare. Train: takes about 3 hours in total, one way. Catch a train from Wongwian Yai Station to Mahachai Station. Cross the river to Tha Chalom Pier. Catch another train from Ban Laem Station to the Maeklong Railway market. Warning: Thai trains are notorious for running late, therefore, this 3-hour journey can easily take much longer. Trains also have no air conditioning so only choose this option if you are up for the Bangkok heat. Tour: if all of the above seems a bit too challenging then you can also take an easy day trip to the Maeklong Railway Market from Bangkok. Check out this option with TakeMeTour, one of their most popular day trips. The tours include all transport, hotel pickup, drop off and lunch! It’s not a bad way to get around. Trains arrive at Maeklong Station 7 days a week. You can visit any day. I recommend that you hang around the railway tracks 10 to 15 minutes before the train arrives or departs. Trains in Thailand are notorious for being late, so you don’t want to wait another hour if you miss the train by just a few minutes! The train market is open 7 days a week from 6.20am to 5.40pm. The Maeklong Railway Market opening hours coincide with the first arrival and last train departure from Maeklong Station. It is best to visit the market in the early morning. Around midday and in the afternoon the market is hot and uncomfortable, especially in the summer. That’s why all the locals are sleeping! 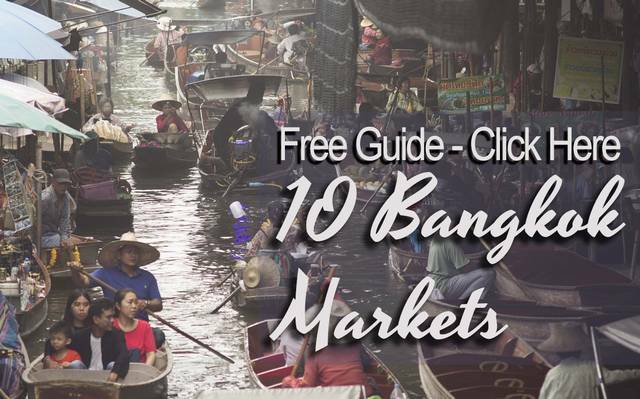 After this market, you can continue on the to the nearby Amphawa and Damnoen Sadauk Floating Markets in the afternoon. 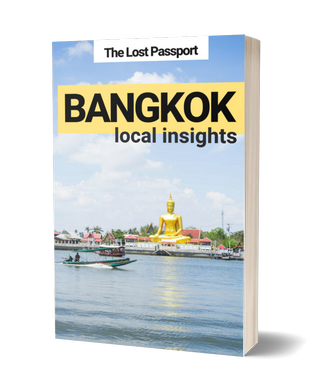 Tip: if you want to discover loads more markets with details of opening hours, days and locations, then consider getting my Bangkok travel guide. 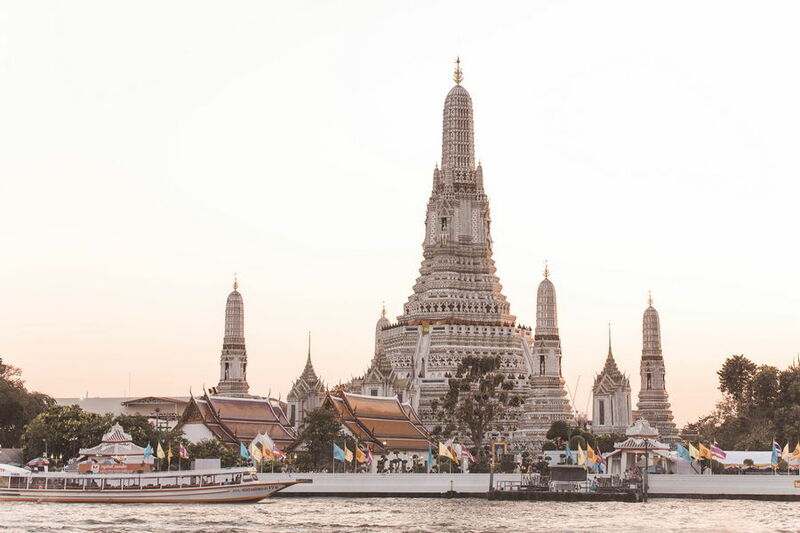 There are over 50 destinations in and around Bangkok. That’s way more than you can see even with a full week in Bangkok! Should you spend a night out of Bangkok near the Maeklong Railway market? Hell yes! 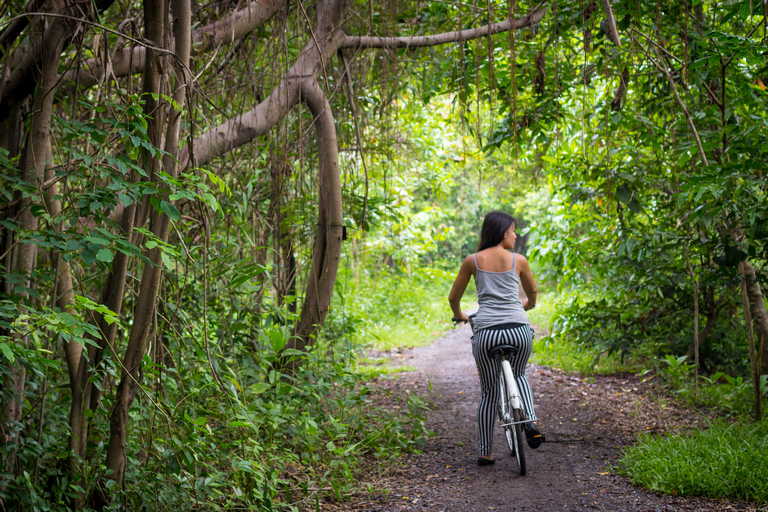 It is a great way to experience part of ‘outer Bangkok’ that many other travelers just don’t get to see, a true insight into what the non-touristy Thai culture looks like. The lifestyle out here is slower than in Bangkok. 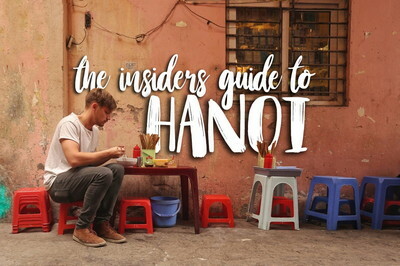 You can forget about the endless traffic jams, annoying Tuk Tuk drivers and the Khao Sarn Road party scene. Replace that with a laid-back village atmosphere where people live by the canals and still get around by boat instead of a car. For an authentic experience, I suggest the Bann Reuan Penn Homestay. This small guesthouse is located right next to the canal (klong in Thai), where you can watch the boats go by in the morning and afternoon. It is also within walking distance of the Amphawa Floating Market, perfect for enjoying the bars and restaurants at night without needing to rush back to Bangkok on the last bus of the afternoon. From just $40 per night for a double room (including free breakfast for two), it is as good a deal as you will find in Bangkok! 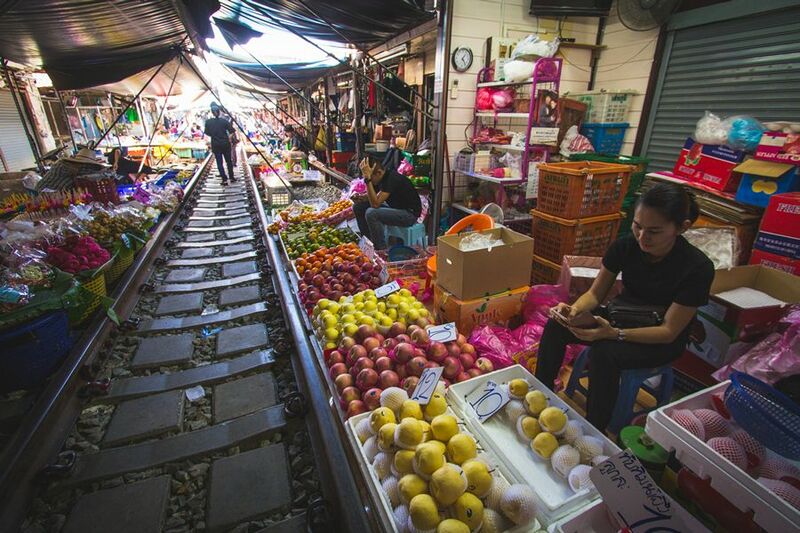 Is the Maeklong Railway Market closed? The market was temporarily closed in 2015 for track repair works. However, the market has since re-opened for visitors every day of the week! Which other markets can I visit nearby? The closest market is the Damnoen Saduak Floating Market in Samut Songkhram. 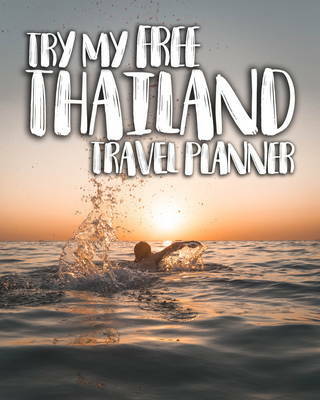 You can get there easily by taxi which should cost less than 100 THB. Other Floating Markets Around Bangkok: Read our detailed reviews of the really authentic Khlong Lat Mayom floating market and the hidden Bang Nam Pheung floating market. Note: this post contains affiliate links. If you click them and make a booking, you will not be charged any extra, however, I will receive a small commission. This market seems pretty good. Also it is on railway track that’s something i wish to see. Great post thank you for this information. 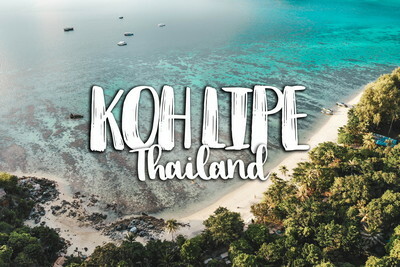 Is it possible to go to Maeklong Railway Market, Damnoen saduak floating market and hua hin (Little Santorini) in a day if we start from Bangkok at 6.30 am ? We are group of 20 persons with private bus. Yes, it is possible. I recommend you go first to Damnoen Saduak Floating Market as this is a morning market, then Maeklong Railway Market. Hua Hin is another 2 hours down the highway. At what time should we go to Damnoen Market? and then how to go from there to Maeklong to get to see the train arrival? Hi Dannah, you can get from the Damnoen Saduak flaoting market to Maeklong Railway market by local songteaw (pick up truck style taxi). You should go to the floating market first in the morning. Hi Dannah, you can get from the Damnoen Saduak floating market to Maeklong Railway market by local songteaw (pick up truck style taxi). You should go to the floating market first in the morning. Hi Josh, l’m heading to Thailand/Vietnam in Jan/Feb for 3 weeks, this will be my first time in Vietnam and wanting to go hiking as l’m an “outdoors” girl …. l’ve been told of “home-stays” , where you stay with a family and they take you trekking , either that or stay in hotel and pay a local for a guide. Have you got any recommendations??? 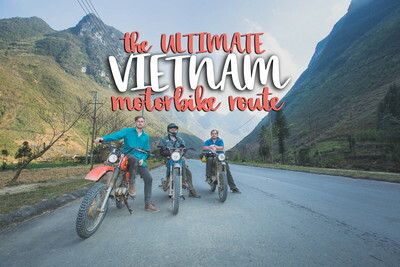 Hi Sharon, there are definitely a lot of home stays with hiking in northern Vietnam (try Sa Pa, Ha Giang or Cao Bang). Thailand’s homestay market isn’t too big, but I’d recommend solo trekking in Ratchaburi, Chiang Rai or Khao Yai. Hope it helps! 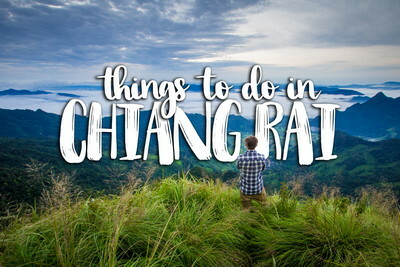 My family of 4 is planning a day trip to visit a floating market + railway market. Was considering to get a taxi. – which place should we go first? I recommend visiting the railway market first, then the Amphawa floating market after (I have a blog post on this market too). The floating market opens after lunch and closes at night. You can generally book a taxi from your hotel, request a driver for the day and who will wait for you while you visit the markets for a daily set price (expect a few thousand Thai Baht). You could also try to get a taxi from the street, but it’ll be a bit more difficult as many drivers don’t like doing long trips. 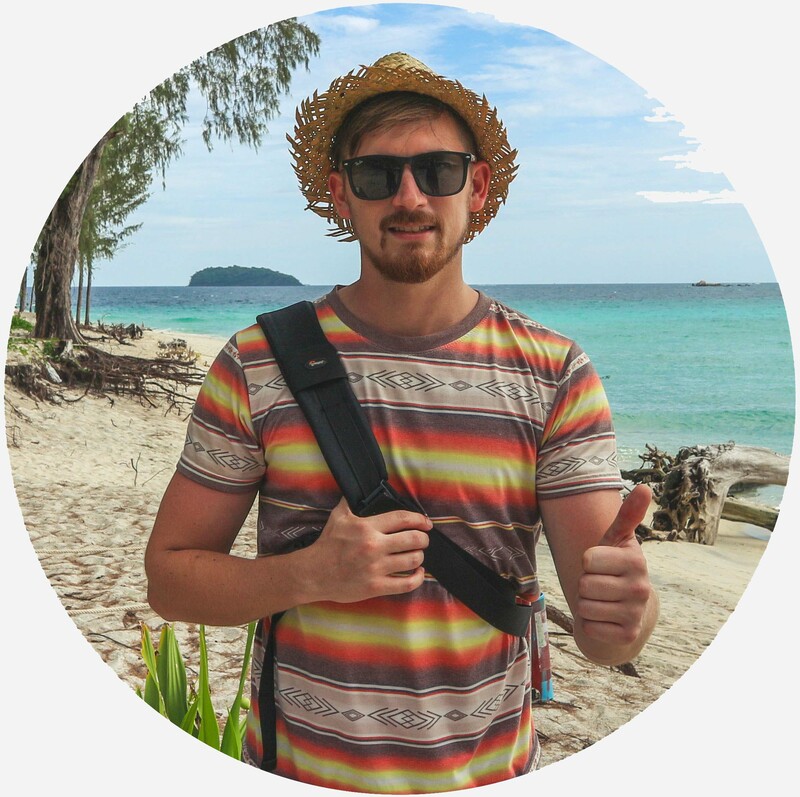 Enjoy your trip and please share the article if you found it useful! Thanks for the useful info, I can’t wait to see the markets tomorrow.